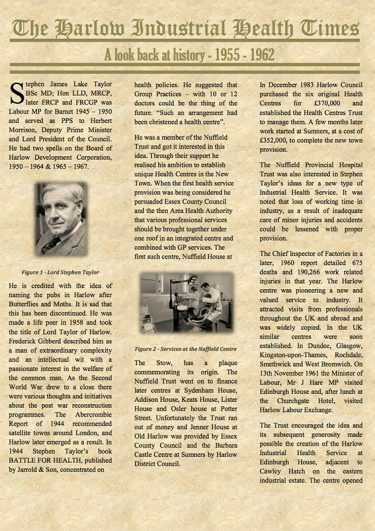 Harlow Occupational Health Services has a long and trusted history, you can learn more about us and the charities origins by viewing the Harlow Industrial Health Times pdf. HOHS was founded in 1955, and so pre-dates the presence of a hospital in the town. We moved to purpose-built premises at Stephen Taylor House in 1992. The building includes consulting and screening rooms, a physiotherapy suite, and a fully equipped training room. The building is located just off Edinburgh Way, so is convenient for the commercial and industrial areas of Harlow. Our building is named after the eminent occupational physician, MP and civil servant Stephen Taylor, who was Medical Director of HOHS, and in 1958 was created a life peer as Baron Taylor of Harlow. Harlow Occupational Health Service, and the Association of Group Occupational Health Services grew from his vision of a small occupational health facility in every industrial town.